Honda Accord is soon to see its new avatar in the US market. 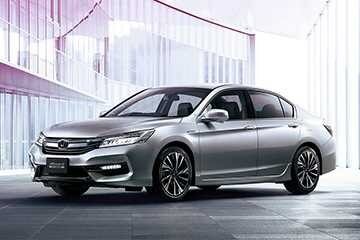 After the pictures, now the prices for the new Accord have also been made official. The price for the 2013 Honda Accord now start at USD 21,680 (Rs.12.02 lakh approx.) and will go up to USD 33,430 (Rs. 18.54 lakh approx.) for the V6 Touring model sedan. The Coupe will start from USD 23,350 (Rs. 12.95 lakh approx.) for the 4-cylinder LX car and will go up to USD 32,350 (Rs. 17.94.) for the V6 EX-L. Alloy wheels, rear view camera, internet radio compatibility, dual zone climate control, 160w audio system, USB or iPod integration and Bluetooth connectivity come as a standard with the new car. However, with Sport one gets bigger alloys, fog lights, electric leather seats, a little increased engine output. The Touring trim gets LED headlights and Adaptive Cruise Control. The hybrid versions will soon get their price tags as well.